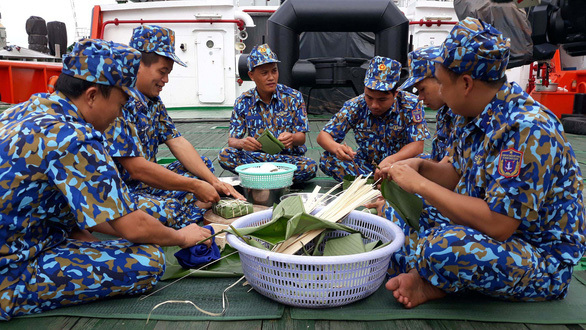 While most Vietnamese were rushing home to celebrate Tet (Lunar New Year holiday), some of Vietnam’s brave coast guardsmen are quietly setting sail to perform their duties in waters far from home so that offshore fishermen could celebrate the holiday with peace of mind. Thang and his fellow crewmen on coast guard ship CSB 9001 under the Coast Guard Zone 3 High Command have only enjoyed one Tet holiday at home since 2010. For the nine Tet holidays that they were on duty, the group welcomed the New Year together as a unity or with other sea patrols. One of Thang’s most memorable Tet holidays was in 2018 when he and his coast guard unit were called upon to rescue a sinking fishing boat near Phu Quy Island off the coast of Binh Thuan Province in south-central Vietnam just ten days ahead of New Year’s Eve. The group mission was to rescue the fishing boat’s crew from where their boat was going down about 30 nautical miles (55.56 km) southwest of Phu Quy. To make matters worse, strong winds, rough seas, and restricted visibility was making it nearly impossible for Thang and his crew to make contact with the fishing vessel. It took nearly four hours of searching, but the CSB 9001 eventually found the sinking boat. “The 12 fishermen aboard were all gathered on the roof of the cabin to shout for help,” Thang recounted. By that point, the roof of the cabin was the only part of the ship still above water. “It was difficult to access the fishing boat because the waves were getting bigger and bigger,” Thang continued. Captain Thang decided to maneuver the coast guard ship so that it could drop raft buoys down to the fishing boat and pull the fishermen to safety. They were able to save ten of the crew members on the first approach, but then fishing boat began to drift away. “We had to constantly motivate [the last two crew members] through loud speakers, telling them to try to cling to the ropes,” Thang said. Eventually, all 12 fishermen were safely rescued and given treatment by the medical team aboard the coast guard ship. During last year’s Tet, the rescued fishermen gifted the coast guard unit that saved their lives fish and chicken as their token of gratitude. “In return, our unit invited some fishermen working near our base to join us on Lunar New Year’s Eve,” Thang said. “We spent holiday with the fishermen, singing, eating candy and banh chung [square glutinous rice cake], and sharing stories about each other’s hometown,” he added. The experience helped the officers and soldiers forget their homesickness at a time when most Vietnamese are with their families. Each year, Thang’s unit works to give themselves a memorable Tet. The team spends time wrapping banh chung a day before Lunar New Year’s Eve and cooks the traditional cakes right through the last minutes of the old lunar year. Importantly, despite having to patrol at the high command station on the last night of the lunar year, Thang’s division still manages to prepare small trays of spring rolls and banh chung for a year-end meal. The banh chung of Thang and his team are often wrapped right on their ship, in the middle of the sea, which gives them a unique test which can’t be found anywhere else. When the clock reaches midnight on Lunar New Year’s Eve, the ship blows its horn while Cap. Thang wishes his team a happy new year and gifts them lucky money on behalf of Coast Guard’s Board of Commanders. Afterwards, the group sings together to ring in the New Year. For the coast guardsmen of CSB 9001, it might not be home, but it’s the next best thing.